This GCF Jeopardy Game is a great online learning game for students to practice and reinforce their knowledge of greatest common factors. This exciting online math game is presented in a jeopardy game format. It challenges students to identify the greatest common factor of a set of numbers. This game has a single-player feature, and a multi-player option. It can be played on computers, iPads, and other tablets. You do not need to install an app to play this game on the iPad. Enjoy this challenging game to test your knowledge and skills. Have fun! CCSS 6.NS.B4 Find the greatest common factor of two whole numbers less than or equal to 100 and the least common multiple of two whole numbers less than or equal to 12. Use the distributive property to express a sum of two whole numbers 1-100 with a common factor as a multiple of a sum of two whole numbers with no common factor. 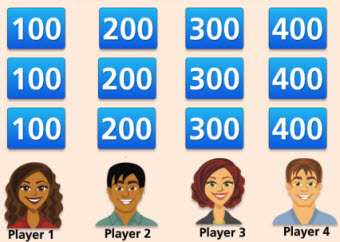 Visit this link to play other free jeopardy math games. Return from the GCF Jeopardy Game game to the Middle School Math Games webpage, or to Math Play.